Today, there are a huge number of modern lining coatings for walls, but Wallpaper is still the most relevant among other interior materials. Manufacturers of Wallpaper are constantly improving in their manufacture, use interesting additives and advanced materials. Because of this, it is possible to choose the Wallpaperwhich will fit perfectly in your home interior. But to stick Wallpaper to the whitewash is unlikely to succeed, as they eventually will disappear. So before you begin to repair, you need to get rid of old Wallpaper, paint and whitewash. The first thing you need to prepare the area for wallpapering, you need to get rid of old wall coatings. If the whitewash pasted the old Wallpaper, try to remove them with a spatula. In places where the Wallpaper does not move away and hold on tight, soak a cloth, apply to the wall and fix this place iron. After removing the old Wallpaper may reveal small defects in the walls of a small depression, etcWallpaperus. Therefore, the presence of cracks and irregularities need to putty the surface of the wall and get rid of dust and dirt. Next, you need to wash the whitewash from the walls. To do this, moisten the layer of whitewash cool water with a brush or brushes and after some time, scrape off the wall with a spatula. Remnants of whitewash rinse with water, do not forget to constantly change the water as the Wallpaper, glued on the whitewash or old distemper, further behind the wall. Before wallcovering programsuite be sure the wall surface is prepared with glue, diluted 20-30% with water. Before beginning work, close the Windows in the room, and avoid drafts - this can be done after complete drying of the Wallpaper. Prepare the glue according to the instructions and mix thoroughly. You can begin to wallpapering. As glue alone is quite difficult, you will need a helper. Before you start to glue the Wallpaper, it is necessary to measure the vertical line of the wall and cut the roll of Wallpaper into pieces with a small margin of 5-10 cm. It is necessary to comply with the periodicity of the pattern. If the Wallpaper is plain or painted, leave a few inches of the stock, as when dry they tend to shrink a little. A piece of the Wallpaper the right size to evenly spread the glue with a brush or roller. Apply glue to the middle of the piece of Wallpaper to the edges. Plastered Wallpaper fold gently in half so that they were soaked with glue and leave for 10 minutes. Impregnated with glue canvas put on the wall and smooth the surface with a soft cushion of bubbles and wrinkles. Rag fit only for paper Wallpaper without patterns in relief. Therefore, for smoothing Wallpaper the most perfect cushion. Begin to glue the Wallpaper from window to door, to avoid visible joints. The cut off excess Wallpaper with a utility knife. Before wallpapering the walls skilled craftsmen are required to prepare the surface for redecoration. It is cleaned from old decorative coatings and carefully leveled, degreased and washed from dust and other contaminants. One of the types of the necessary preliminary work is taking the old lime from the wall. Sometimes the plaster is so sturdy and high quality that with a good primer and you can stick Wallpaper directly on the painted surface. Make sure that the old plaster on the surface to be pasted on the wall is good enough, it never is separated in pieces and has no cracks and chips. Sometimes this covering paper Wallpaper hold well, their appearance is long on the top. However, when working with white you always run the risk of from Wallpaper paste lime can get wet and eventually flake off. On the Wallpaper there will be ugly bubbles, and the paper web can even move away from the wall along with a particle of whitewash. It is recommended to glue a test sample (one paper background) so as not to spoil the material. If whitewash is not an obstacle for a quality repair, you can start pasting the whole wall. Apply whitewash high quality (deeply penetrating into the wall surface!) acrylic primer. After complete drying of the first layer put the second. Next, you need to dilute clay with water (20%) and once again primed the wall of the obtained composition. Only after these manipulations it is possible to glue the Wallpaper. Choose a good Wallpaper paste at the hardware store with a good reputation! From its composition and technical characteristics will depend tight lies Wallpaper on the whitewashed surface. In no case do not skimp on the glue; note that each blend is developed for a specific type of finishing material. Carefully read all information from the manufacturer on the packaging and strictly adhere to these instructions. If the quality of the wash is low, it is best to thoroughly wash it off the wall. To clean easy to use old pieces of tulle or net bag from the vegetables; you can also use a brush. Moisten a white-washed wall surface with room temperature water and allow the liquid to impregnate the decorative covering. The remains of whitewash softened remove with a scraper or knife. - smooth with a soft cloth (or a special roller and brush) adhesive strip from the middle to the edges, from ceiling to floor. On the paper surface should not have formed bubbles and crushed "accordions"! If you are not satisfied with the quality of glued strips of Wallpaper, siderite it from the wall. Don't expect the bumps will disappear over time, and sloppy joints will not be noticeable. Redo this work, so that the final result of the repair you really pleased. Wallpaper is one of the most common types of finishing materials. 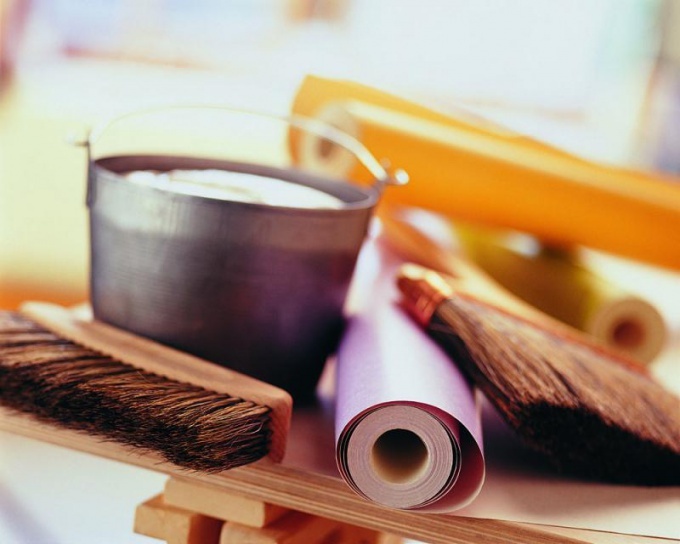 Stick them on a carefully prepared surface to avoid re-work, especially if the walls have been whitewashed. If you plan to pasting Wallpaper on the white-washed walls, it can be done only if the layer of lime is small and holds quite firmly. Before wallcovering conduct a thorough preparatory work. Buy at the hardware supermarket acrylic primer. Apply it on the wall using a large paintbrush or roller. Allow primer to dry for 24-36 hours, again repeat the layer to dry and then cover the walls on the third time. Proceed to the wallcovering after 24 hours after applying the third coat of primer. Drying time depends on room temperature. The higher the temperature, the less time it will take to dry each coat of primer. 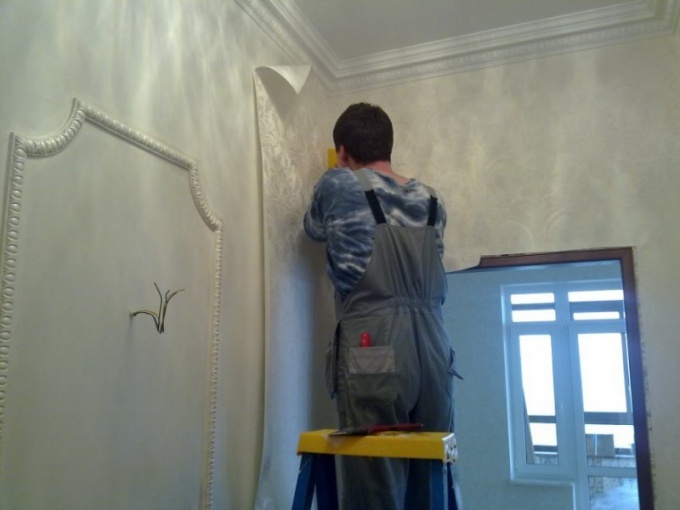 If the whitewash on the walls a lot and it started to flake off in places, you do not help no primer, since the Wallpaper will simply fall off with a layer of lime. In this case, the inevitable clean and the plastered walls then it is possible to glue the Wallpaper. For the removal of lime from the walls, use an iron spatula, brush, cloth and water. To dust as small as possible, liberally moisten the wall, remove the layer of lime with a putty knife and wire brush again carefully rinse the walls, zashpaklyuyte. After removing the wash, thoroughly dry the premises, apply to the putty one coat of primer, dry wall. Wallpaper can be pasted in a dry place at zero temperature. If you don't take sufficient time to dry, despite the fact that the walls will be cleaned from lime, Wallpaper can fall off and you will have to redo all the work. Wallcovering, use a quality glue that is suitable for the kind of materials that you are going to apply. This will also be the guarantee that the Wallpaper will stick quite firmly.